When and under what conditions States may lawfully employ force currently preoccupies government decision makers, academics, journalists, and policy makers. As war in Syria rages, the seemingly endless conflicts in Afghanistan and Iraq metastasize into new forms of violence, North Korea threatens Seoul and the United States by launching and testing nuclear-armed missiles, the 45th U.S. President threatens “fire and fury like the world has never seen” in response, ISIS-affiliated individuals launch deadly attacks against civilians in European capitals, increasing number of incidents involving naval forces are taking place in the South China Sea, and Russia invades and annexes portions of Ukraine, there is growing concern that the Post–World War II international legal order is under terrible stress. This unease is exacerbated by positions taken by the United States government and many in the academy, where distinguished scholars have announced the “death” of Article 2(4) of the U.N. Charter prohibiting the use of force, and war-talk has become so normalized that prominent academics like Rosa Brooks have suggested that human rights lawyers insisting upon clear distinctions between war and peace (under the jus ad bellum) and well-established applications of the laws of war (the jus in bello), are “wast[ing] time and energy” and engaging in “self-deception” because “events march inexorably on.” Instead, she suggests that we should “develop laws, politics, and institutions premised on the assumption that we will forever remain unable to draw sharp boundaries between war and peace, and that we will frequently find ourselves in the space between.” A space between that allegedly constitutes the new normal – a normality based upon the Colossus that is the American military and its “war” against terror, which, in the views of some, is unlikely to diminish over time. This thesis, and the assumptions that underlie it, causes others to believe that the “greatest threat to world peace today is Washington's imperial power.” And this power is formidable. The United States spent close to 36 percent of the global total of military spending, and in terms of arsenal, has more nuclear weapons, aircraft carriers, and intelligence capabilities than the rest of the world combined. This book is the result of three years of hard work. But it builds upon centuries of inspired thinking and practical efforts to constrain war. 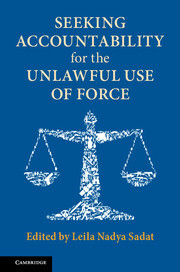 As the chapters in this volume outline, the efforts to constrain violence and impose accountability on aggressors include Hammurabi's Code, the 1899 and 1907 Hague Treaties with their Martens Clauses, the Kellogg–Briand Pact, the Nuremberg and Tokyo trials and judgments, the establishment of the United Nations, the decisions of international courts, arbitral tribunals and fact-finding commissions, the development of just war doctrines and the Responsibility to Protect, and, most recently, the establishment of the International Criminal Court and the activation of the Kampala Amendments on the crime of aggression. These efforts show that even during the darkest days of war, men and women have never given up the dream of a world at peace in which violence is the exception, rather than the rule, and in which lawful violence is defined and cabined by robust legal frameworks. This volume would never have been possible but for the generosity – and leadership – of both Ben and Don Ferencz, who helped with its conceptual framing, funding, and implementation both in their individual capacities and through the generosity of the Planethood Foundation. Ben's faith in the rule of law and its capacity to serve the interest of peace has been an inspiration for more than seven decades. Don, equally, has become a passionate advocate for the rule of law in the service of peace. I, personally, and the world entire, are indebted to them for their perseverance, clear-sightedness, wisdom, and faith in humankind's ability to do better than it has done in the past. I am also grateful to Harris Institute Fellows Fizza Batool, Madaline George, Kristin Smith, and Tamara Slater, who worked on the volume from conception to realization, and to Bethel Mandefro, the Institute's Program Coordinator and Office Manager, who helped with the logistics of our St. Louis Conference in 2015 and with shepherding the volume through publication. It would be remiss to omit the many students who worked on the volume as well, including Kaitlyn Byrne, Kelly Mullen, Jesus A. Osete, Brittany Sanders, and Caroline Tunca. I would also like to thank John Berger, my editor at Cambridge University Press, who has helped me with this as well as other publications. The International Criminal Court has faced a number of challenges to its legitimacy and effectiveness. One recent struggle stems from the Kenyatta case, which was confirmed in 2012, and became increasingly fractious and politically charged when Uhuru Muigai Kenyatta was elected President of Kenya in 2013. The ICC faces similar difficulties with the trial of William Samoei Ruto, Kenyatta's running mate, who is currently serving as Kenya's Deputy President. With the possible exception of the situation in Darfur, no other situation has posed as grave a challenge to the Court, and particularly the Prosecutor, than the investigation and prosecution undertaken by it in the wake of the brutal postelection violence which shook Kenya in 2007. The Kenya Situation is the only one referred to the Court by the Prosecutor acting truly propriomotu, and has been objected to by the territorial state from the start, which has refused to cooperate with the Court in some respects. Perhaps most problematic, however, is that the accused in the Kenyatta and Ruto cases have argued that they are not required to appear before the Court because of their high-ranking office. Their insistence on special privileges and prerogatives fl owing from their high office is reminiscent of arguments made by the Kaiser following World War I, and the accused before the Nuremberg Tribunal following World War II. The accused have challenged a foundational premise of the Rome Statute – that it applies ‘equally to all persons without any distinction based on official capacity’ – a principle codified by the International Law Commission as one of the seven ‘Nuremberg Principles’ in 1950,2 and found in countless international instruments, including the Genocide Convention, amongst others. Were Kenyatta and Ruto the only accused to raise this argument, it might be seen simply as aggressive defence tactics. However, there has been a renewed push from African states and the African Union to prevent the trials of sitting Heads of State, a push that has caused the ICC Assembly of States Parties to adopt a special exception for Heads of State on trial (Rule 134quarter), and has led to blistering attacks upon the Court from partisans of Kenyatta's position. This article draws on well-established understandings of international treaty interpretation and the role of the judicial function to propose seven canons of treaty construction that may serve as the basis of a principled interpretation of the substantive law of the Rome Statute. This interpretative framework is then applied to the seemingly intractable debate within the Court and among scholars over the correct interpretation of Article 25, on modes of liability. The seven canons provide guidelines that may enable the ‘Rorschach blot’ of Article 25, capable of many divergent interpretations, to become uniformly and consistently understood and interpreted. Can the ICTY Šainović and Perišić Cases Be Reconciled?